Bullitts made his way down from Pawtucket, RI several years ago. In February of 2004 he joined our gang and has been a loyal member of ‘the family’ ever since. Probably ‘cuz he needs the kale to feed his ever-growing family. Yous sees Bullitts has seven children – hince the name, Bullitts. Yous can believe we’ve heard him say, “no ‘shooting blanks’ jokes, folks” more often than we can count! Even at home, Bullitts has an audience, so it jus’ stands to reason why he’s so good at gettin’ a crowd involved. One thing’s for sure, all those mouths to feed keeps Bullitts on his toes and workin’ hard at my joint. One of the things Bullitts likes best ‘bout working at this Kissimmee dinner show is the atmosphere. He loves interacting with guests and being a goofball. There’s nothin’ like a goofy gangster runnin’ ‘round makin’ people laugh. Speakin’ of runnin’ ‘round… There was a time Bullitts’ hands were full of glassware and his belt decided to break. Wow! What a show! Even with his pants fallin’ down – stopping the show in laughter – Bullitts didn’t skip a beat. What a pal! At Capone’s Dinner & Show, one of our guests’ favorite part is the audience interaction. We can get everyone involved somehow. Even the kids. Then there are some people that jus’ love to heckle. If you’s one of ‘em, Bullitts can out-heckle the best of hecklers! I’d bet on it, if I were a gamblin’ man. Alternately, if you’d rather not get so involved, ask for a table farther away from the action when yous make your reservation. We understand not everyone loves being in the spotlight like Bullitts does. He likes it so much that he wishes we had more than one show a day! Yous know what? Some days we do have two shows! Visit our showtimes page and see when matinees, early shows and late shows take place. More than likely Bullitts will be here waitin’ on yous. As it is (unfortunately), there are times our guests take the audience interaction a little too personal. Our wise guys are pretty quick to pick up on the high-hats that can’t take a joke. But seriously folks, if Bullitts can joke with a lady in a wheelchair tellin’ her he’s going to switch out her oxygen tank with laughing gas, then yous can lighten up too, capisce?! It’s not like we’re going to put yous in front of the chopper squad if yous smile a little. Forget-about-it…We’re here to have fun! How to Meet Bullitts – Buy Discounted Dinner Show Tickets! If you’d like to meet Bullitts, or any of my wise guys and gals here at Capone’s Dinner & Show, we’ve made it easy. Jus’ make your reservations online and get half price tickets! Come to our speakeasy an’ be part of the great audience interaction that Bullitts an’ the gang make happen every evening. Your entire family (including your 7 children) will enjoy the show and can play a part in the action. The laughter will do yous good, and the evening will be one for the history books. While you’re a guest at Capone’s Dinner & Show, be sure to meet Bullitts. He’s here nearly every night of the year. When he’s not, well, you can only imagine what he’s doin’ at home. We love our family & invite you to be a part of it too! Join us one evening soon. If you’s lookin’ for excellent service while havin’ a meal, meet “Stretch.” He’s a real goon… I mean good guy, workin’ at my Speakeasy. All the servers at my joint are special, but this month’s featured ‘bruno’ is Stretch. As yous might be able to see from his mug shot, the numbers don’t lie. Stretch is a tall fella. Hince his name. Stretch came ‘round from the Tampa area needing cabbage ‘bout two years ago. We’s lucky ‘nough to snag him into our gang. He’s a hard worker always providing excellent service pleasin’ the guests. Even the ones that don’ seem to want to be pleased. Yous know the ones. He takes it real personal when anyone doesn’t respect the experience him an’ his pals have worked so hard to create. So show some respect next time yous see him! Capisce?! At Capone’s Dinner & Show, we expect extraordinary guest service and Stretch performs his duties well. So much so that guests ask for him on their return visits. This makes him feel real keen. He has a gift of blendin’ in his unique guest service skills while stayin’ true to his own character. And what a character he is! One guest liked him so much, they licked his elbow while he was pourin’ a pitcher! We’s don’ know why. Maybe they’s were real thirsty, but we’re hopin’ it was a sign of endearment, not some way of spreadin’ somethin’ we’s don’ need ‘round here. Perhaps they thought they were in some hash house, ‘nstead of my classy joint. Either way, Stretch handled it with professionalism and performed his duties without skipping a beat. How to Meet Stretch – Buy Cheap Tickets! 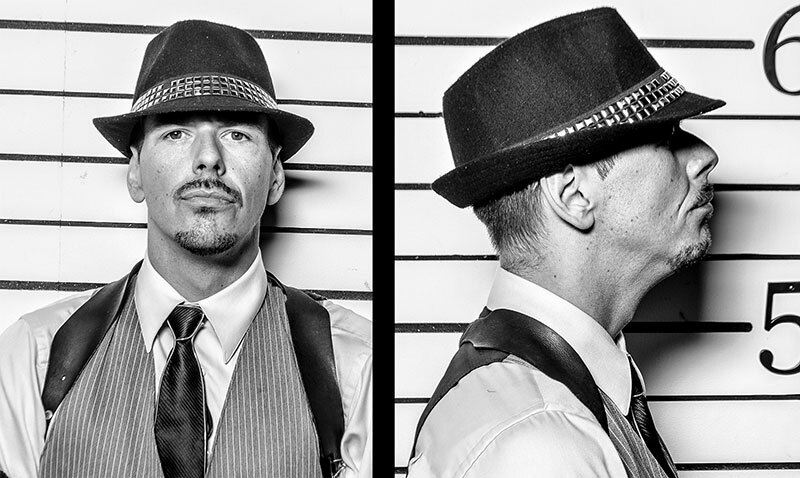 If you’d like to meet Stretch, or any of my wise guys and gals here at Capone’s Dinner & Show, we’ve made it easy. Jus’ buy your tickets online at half price! Come to our speakeasy an’ let Stretch an’ the gang show yous a great time. Your entire family will enjoy the show and receive excellent service. The food will fill yous up, and the evenin’ will be one for the history books. While you’re my guest at Capone’s Dinner & Show, be sure to meet Stretch. He’s not hard to find; jus’ look for the tallest server here. He loves to meet people of all types. After a long, frustrating day at a theme park, or doin’ whatever you’s doin’, Stretch will turn your day ‘round with excellent service. Your gang will be lookin’ up… and up …and up! Capone’s Dinner & Show will be closed Sunday, February 4, 2018. For the past 3 years, me (Al) and the gang at Capone’s Dinner & Show did NOT offer a Super Show as an alternative to the Super Bowl. The mobsters took a much-appreciated break. The gang is doin’ it again. We will be closed Sunday, February 4, 2018. After all those wings bein’ devoured and money changin’ hands, a fun night at Capone’s will be in order. Regardless if your team wins or loses, a night with me and the gang is a great way to recover after a big game hang-over. Reserve your tickets at half off and enjoy savin’ money instead of shellin’ it out like yous jus’ did on the football contest. Capone’s Dinner & Show is open every night (except on Super Bowl Sunday). After takin’ a night off, the guys and gals will be super-charged to put on a hilarious show. I’ll see yous soon! No NYE Plans? 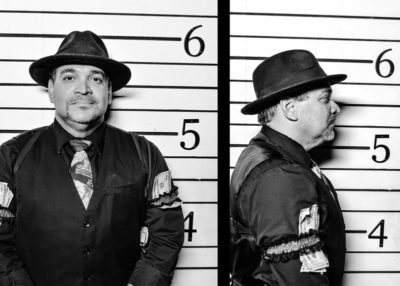 Capone’s New Year’s Eve Tickets Available! New Year’s Eve Tickets Still Available! If yous jus’ want a special evening out with that special person in your life, we’ve got a section in our joint that offers seating for “shy” folks. It’s a little more private, yet you’ll still have a great view of the stage (and those gorgeous dancers). Thinkin’ ‘bout popping the question? Let us know! * We can arrange this momentous occasion to be a special affair. Many happy couples have shared their proposal with the gang here at our Orlando dinner show. Get your New Year’s Eve tickets now. It will be a night to remember, that’s for sure! On the other hand, do you have a rowdy gang? We’ve got seating jus’ for yous too! Get involved with the show and have a blast! 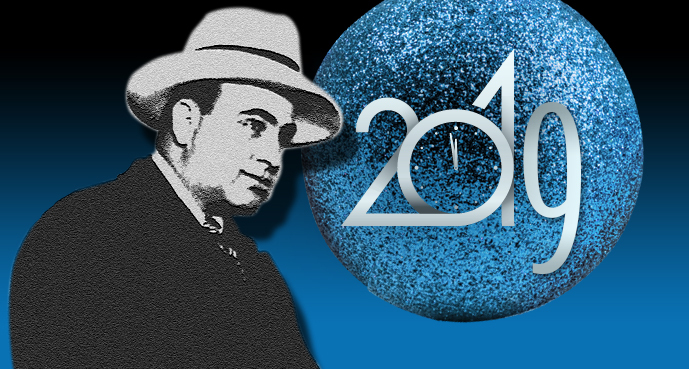 Our gangsters can party with the best of ya’s, so get your New Year’s Eve tickets and join us! While you’re gettin’ your New Year’s Eve tickets, don’t forget to pick up a boa for the ladies and a fedora for the gents. Dress up for the affair 30’s style with our “dress the part” costume accessories. We’ve got something for everyone at a price that won’t break the bank. New Year’s Eve Tickets for our Gala are $69.99 (plus tax) for adults and $49.99 (plus tax) for children. Coupons are not honored for this event. VIP tickets (if still available) are $84.99/adult and $59.99/child. In addition to the late gala, if yous don’t want to stay up to ring in the new year, yous can join me and my wise guys for the early show startin’ at 5:00 p.m. This dinner show is perfect for gangs that want to count down to midnight at home or somewheres else. We offer a lot of the festivities at the early show and yous can use my coupon and get into my joint at half price! Regardless of where you and your family celebrate the arrival of the New Year, me and my gang want to wish you a very happy New Year. Designate a driver or take a cab if you’ll be enjoying libations. Those coppers will have their hands full with the goons that refuse my good advice. Join me and let’s toast at midnight to have a safe and most prosperous 2019! *The staff at Capone’s Dinner & Show enjoy helping to celebrate special occasions, such as marriage proposals. You must notify our staff at the time you purchase your tickets and make your reservation. A follow-up phone call is also recommended. Any additional plans must be made with plenty of notice; no last-minute plans, please. Our staff will gladly participate in approved variances of our show in order to make your special proposal as extraordinary as it can be.